As the Weis Center kicks off its 30th Anniversary season and celebration, we wanted to begin an online celebration of our own by exploring the history and stories behind this historic venue. 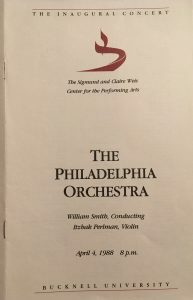 We thought it best to begin by looking into the events leading up the Center’s inaugural performance on April 4, 1988. The Sigmund and Claire Weis Center for the Performing Arts was constructed between 1985 and early 1988 with a projected total cost of approximately $9.7 million. 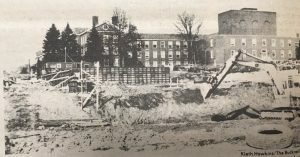 The bulk of the funds came from a generous trust given by the estate of Claire Weis, mother of former Bucknell chairman of the Board of Trustees and Weis Markets co-founder, Sigmund Weis. Coverage from the remaining cost came from funds raised by a former University fund-raising drive entitled “Campaign for Bucknell”. An opening committee was created to discuss and implement plans regarding the Center’s official launch. According to the Bucknellian, the University’s student-run newspaper, members included an English professor, a history professor, a music professor, and Weis Center Events Coordinator Jim Hammerlee. The committee decided to use the fall 1987 semester as a testing period where University student groups were encouraged to perform at the Center in order to check the sound system and staging logistics. 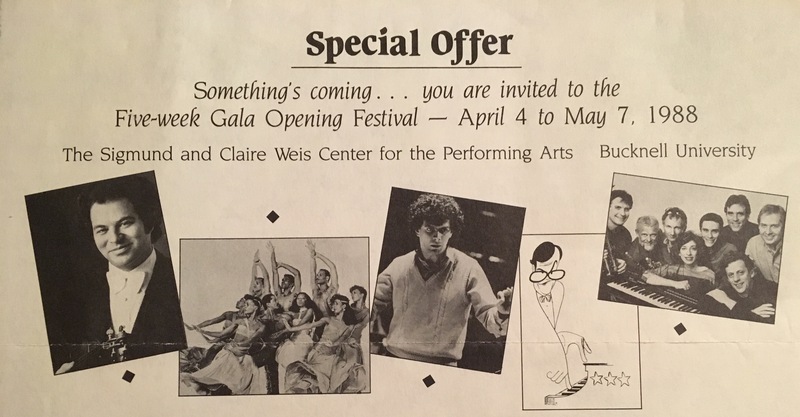 This “soft opening” preceded what became officially the “Five-week Gala Opening Festival” in the spring of 1988 wherein regional and local groups were invited to perform. Interestingly enough, early correspondence from Hammerlee indicated that everyone’s favorite Piano Man, singer-songwriter Billy Joel, was eyed as a midseason performer at the Center during the five-week opening gala festival. Jim’s hope was to book a contemporary artist with a broader appeal to engage and excite the Bucknell student population with the arts. While Joel had previously performed at the University twice in 1976, he unfortunately did not put in an additional Lewisburg appearance at the Weis Center in 1988. The next performance in the Weis Center’s 2017-18 Season is a free roots performance by Ranky Tanky on Thursday, September 7 at 6 p.m. on the Weis Center’s Plaza. The rain location is the Weis Center Atrium Lobby.